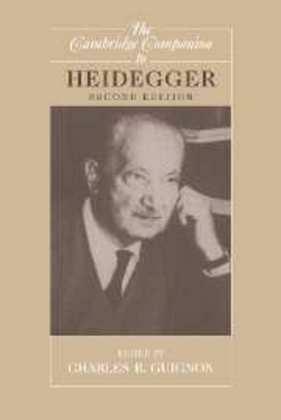 Martin Heidegger is now widely recognized as one of the greatest philosophers of the twentieth century. He transformed mainstream philosophy by defining its central task as asking the 'question of being'. His thought has contributed to the turn to hermeneutics and to postmodernism and poststructuralism. Moreover, the disclosure of his deep involvement in Nazism has provoked much debate about the relation of philosophy to politics. This edition brings to the fore other works, as well as alternative approaches to scholarship. The essays cover topics such as Heidegger's conception of phenomenology, his relation to Kant and Husserl, his account of truth, and his stand on the realism/anti-realism debate. This edition includes a new preface by the editor, revised versions of several essays from the first edition, and an exhaustive bibliography, providing guidance for both newcomers to Heidegger's work and established scholars. List of contributors; Abbreviations: works by Heidegger; Chronology; Preface to the second edition; Introduction Charles B. Guignon; 1. The question of being: Heidegger's project Dorothea Frede; 2. Reading a life: Heidegger and hard times Thomas Sheehan; 3. The principle of phenomenology Taylor Carman; 4. Time and phenomenology in Husserl and Heidegger Robert J. Dostal; 5. Laying the ground for metaphysics: Heidegger's appropriation of Kant William Blattner; 6. Heidegger and the hermeneutic turn David Couzens Hoy; 7. Engaged agency and background in Heidegger Charles Taylor; 8. Death, time, history: Division II of Being and Time Piotr Hoffman; 9. Truth and the essence of truth in Heidegger's thought Mark A. Wrathall; 10. Authenticity, moral values, and psychotherapy Charles B. Guignon; 11. Heidegger, Buddhism, and deep ecology Michael E. Zimmerman; 12. Heidegger and theology John D. Caputo; 13. Heidegger on the connection between nihilism, art, technology and politics Hubert L. Dreyfus; 14. The fourfold Julian Young; Bibliography; Index. Charles Guignon is Professor of Philosophy at the University of South Florida. He is the author of Heidegger and the Problem of Knowledge and On Being Authentic, and editor of The Good Life, The Existentialists, and Richard Rorty.